Below is a selection of reviews and feedback received on Pinball Magazine No. 3. Pinball Expo (Wheeling, IL): 10 boxes shipped, all available copies sold. Around the show floor several posters of the cover where hung on several walls. Before the show was over all posters had “disappeared” and numerous requests for them came in. “Mine came in the mail today, here in lonely South Dakota.” – Hans H.
“Just wanted to say, I really love the new Pinball magazine issue#3. I was wondering if you sell a poster or cover photo of the #3 issue?” – David P.
“Thanks for your hard work with the magazine. I am through half of the copy I received and I am really impressed about quality and depth. Big addition for every pinball fan to the hobby!” Harold K.
“Mine arrived yesterday (full set) and I haven’t plunged a ball since as the “books” are amazing! 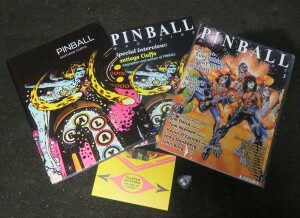 These are a must have for all pinball collectors, so many interesting facts and interviews. Thanks Jonathan for all your work I’m down for every future issue as they just get better!” – Geoff. “I wanted to get in touch to let you know that I have received my copy of Pinball Magazine issue 3 and let me say from the outset, WOW, it is superb – from the great (safe) postal packaging, bubble wrap with personal note, to the very thick (plenty of awesome pages) magazine! 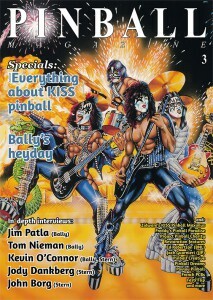 I’m interested in getting this pinball magazine. Where do I order it?